The Havant and Portsmouth Deanery Lady Day Service was held on 4th April in St George’s Church. The service was led by Fr Mike Sheffield and the Ven. Dr Trevor Reader, the MU Chaplain. During the service Wendy Clark was presented with a certificate marking her 50 years membership of the Mothers’ Union. Refreshments were served in the Church Hall following the service. I was proud to receive a 50 years’ membership Mothers’ Union Certificate at St George’s Church, Waterlooville Lady Day Service on 4th April 2016. It matched the memories I have of receiving my membership from St Matthew’s Church, Lightcliffe, Halifax, as a very happy Mummy with an eleven month old daughter, Judith on 13th January 1966. Even today, we are similarly placed, removed from our roots in Coventry, our home town for all the family. We have always been supported by an extended church family wherever we have been living and are very grateful currently to St George’s Waterlooville. I sprinted up the road to the Baptist Church, being rather late, and arriving just before 2pm was surprised to find a nearly empty church and no-one there that I knew. I feared for some minutes that I had mistaken the day and strayed into a service to which I had not been invited! However, on checking my diary (MU of course) I discovered I had misread the time and arrived half an hour early (unusual for me - the earliness not the misreading!). Eventually I was joined by other St George’s members and the Womens’ Fellowship Anniversary Service began. Always a lovely service this year the speaker was Major Gillian Smith of the Salvation Army whose theme was “No Limits”. After the service a delicious tea was provided in the adjoining hall. We are always made very welcome at Waterlooville Baptist Church and had a most enjoyable afternoon there. Our April monthly meeting was on the Mothers’ Union theme for this year which is “A Celebration of Faith”. As we celebrate our 140th Anniversary, this meeting, led by Pauline Wale, helped us to explore the past, present and future challenges facing the MU with family life changing over the years, increased pressure on time and resources. Five members went to a coffee morning at Christ Church, Portsdown on Saturday 14th May. Held in their Church hall, there were stalls for cakes, books, toiletries, bric-a-brac, and MU Merchandise, as well as a raffle. We had coffee and tea, with toasted teacakes, butter and jam - lovely! We were invited to the Baptist Church again on Tuesday 24th May for their “Songs of Praise and Cream Tea”. This was held in a full hall, with ladies and a few gentlemen seated at large tables. We all had a hymn book and sang several well known and much loved traditional hymns, interspersed with readings and prayers. Afterwards there was tea, with scones, jam, and cream. 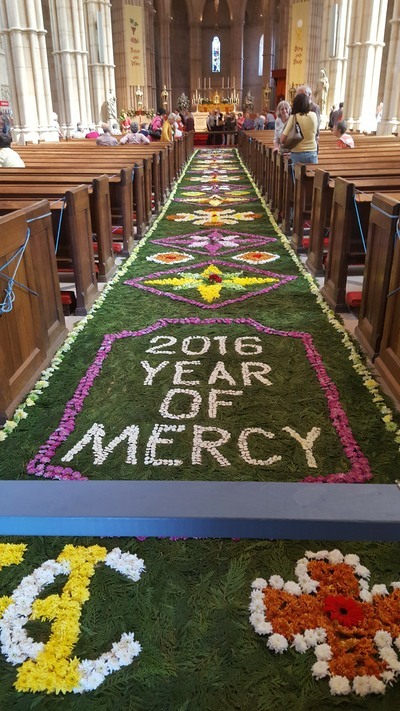 Our branch outing, on Thursday 26th May, was to see the Corpus Christi “Carpet of Flowers” at Arundel Cathedral. Nine of us went in three cars. The tradition began in 1877 after Henry, XV Duke of Arundel, saw a carpet of flowers in the Italian village of Sutri, near Rome, and brought the idea back with him to Arundel. The Nave is covered by the display and is most intricate and beautiful; the work of placing the flowers being carried out entirely by Parishioners. As well as the small shop, there were stalls set out around the Cathedral selling gifts, souvenirs and photographs of the display. Afterwards we all met up again at the Cathedral Centre Cafe for afternoon tea.